Who Celebrates National School Choice Week? (NewsUSA) - With more than 32,000 independently planned events around the country, the week of Jan. 21-27 will be the largest-ever celebration of opportunity in education. 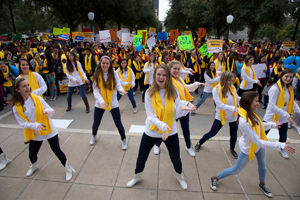 It's the seventh annual National School Choice Week, a nonpartisan, nonpolitical awareness event that has grown considerably every year - it's up from 21,000 last year and 150 events in its first year. So who are the people leading the celebrations? Some are parents who put themselves in the driver's seat of their children's education. They considered their children's unique needs, learning styles, and interests. They looked at the available options - traditional public schools, public charter schools, public magnet schools, private schools, homeschooling, online schools, or a combination of these options - and chose the education environments they considered best for their children. Some tracked down publicly or privately funded scholarships; others checked waitlists; and many others decided that their local school was, in fact, the best fit for their children. Some event organizers are teachers and school leaders, happy to be playing such a crucial role in the education and development of children across America. Different schools offer different curricula, different approaches to education, different perspectives - and this diversity is worth celebrating. Every child is unique; every family is unique. Children who are excited about violin or Mandarin, children who need an extra lift in a particular area, children who thrive in traditional classrooms and children who don't - everyone should be given an opportunity to excel in whatever way best suits them. And great teachers and school leaders are an essential part of that excellence. Some events are planned by community leaders hoping to help even more children have the opportunity to reach their full academic potential by creating new paths and raising awareness about the importance of continually expanding access to effective education options for children and families. The participants in National School Choice Week may all be different, with unique perspectives, backgrounds, and stories. But they all believe one thing: that every child, given the right environment, can succeed. No matter what school your family has chosen, National School Choice Week provides an opportunity to celebrate students and the hope of a bright future for our whole nation.